Lot # 92: 1938 Goudey Heads Up #274 Joe DiMaggio (PSA NM/MT 8) – Only 3 Graded Higher! 1938 Goudey Heads Up #274 Joe DiMaggio (PSA NM/MT 8) – Only 3 Graded Higher! "Joltin Joe DiMaggio, we want you on our side"! No truer words were ever spoken than the lyrics in Les Brown's iconic "Joltin Joe DiMaggio" song written in 1941 to commemorate his remarkable 56-game hitting streak! Simply stated, who wouldn't want the immortal Yankee Clipper on their side with DiMaggio's incomparable skill sets placing him as one of our National Pastime's greatest players to ever grace a baseball diamond. There isn't a single person who doesn't understand the significance of Joseph Paul DiMaggio's place in American history for Joltin Joe's unparalleled legacy goes far beyond his baseball exploits. His virtually surreal marriage to the dynamic "blond bombshell" Marilyn Monroe more than solidified his eternal standing as the true embodiment of a National Hero. That, coupled with his incredible baseball resume that includes the seemingly insurmountable 56-game hitting streak, multiple MVP awards, Yankee World Championships (including four consecutive titles between 1936 and 1939) have etched an indelible mark in the hearts and minds of baseball purists. No wonder his earliest baseball cards are highly sought after by the collecting community with only a mere handful as significant as this breathtaking PSA NM/MT 8 1938 Goudey #274 Heads Up marvel that has been bested by only 3 paltry examples! Many advanced collectors still regard this issue as one of the true "American issued" Joe DiMaggio mainstream rookie cards with his 1936 World Wide Gum and 1937 O-Pee-Cee subjects both Canadian issues. 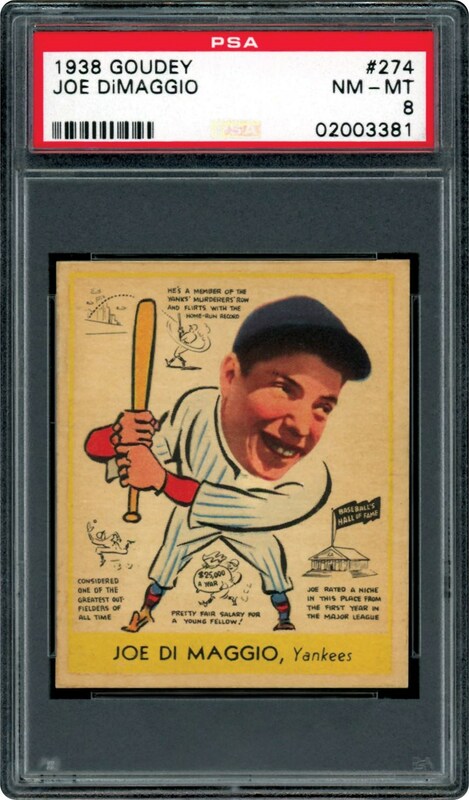 The classic DiMaggio line-drawing batting image including the ultra-popular caricature portrait illustration portrays magnificent contrast with superior blue, red and yellow coloring, set against a relatively clean background. One of the most recognized cardboard pictures, it reminds avid baseball fans of the superior batting skills possessed by "Joe D." that ably assisted him in tallying 361 lifetime dingers versus a remarkably low 369 strikeouts, by far the most incomprehensible display of bat control for a power hitter in baseball history. The super desirable DiMaggio black text comments and cartoon drawings encompassing the caricature pose are bold and vivid, with the "JOE DIMAGGIO, Yankees" black print along the lower radiant yellow text box reflecting superior registration. Razor sharp corner tips could draw blood, and the sanctified image within the yellow framing is virtually dead-centered (only a subtle favoritism towards the left edge) between four super clean borders. The verso is likewise brilliant, with the bold green verbiage affixed to a bright white surface; the final exclamation point for this sparkling cardboard keepsake that appears as if it has just been removed from a 1938 Goudey pack. To reiterate, we cannot over emphasize the significance of the "Yankee Clipper's" place not only in baseball history, but as an American hero. 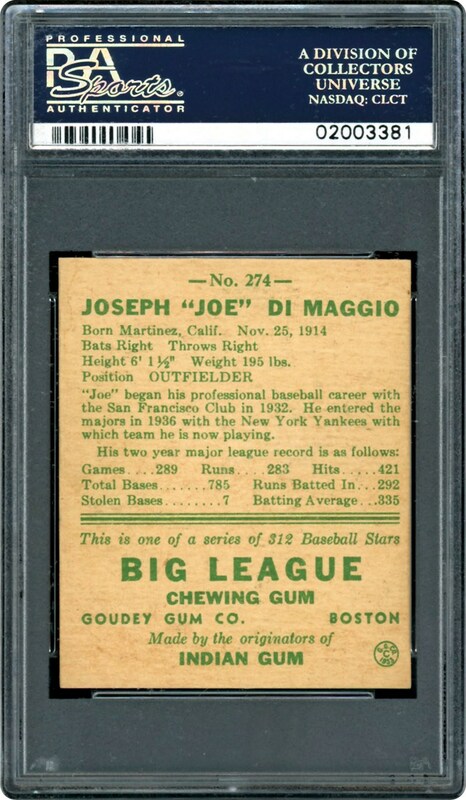 Extraordinary to say the least, this truly spectacular Goudey heirloom literally turns back the clock, stimulating the avid collector to crave their youthful innocence and dream of standing in the batter's box or track down a batted ball with the unparalleled elegance of "Joltin Joe"! MLI is offering a Super High-PSA Grade 1938 Goudey "Heads Up" Near-Set in an alternative selling format. All Lots numbered from 92-136 will be sold individually to the highest bidder, unless Lot # 91's hammer price exceeds the hammer price of Lots 92-136 combined cumulative total. In which case, the cards would be sold as a set. Once bidding starts, the green check mark below simply designates which format has the current high bid. In case of a tie - the set wins.